(Pomona) – Davon Booth, Abel Cuevas and Ben Owsley combined for nine touchdowns as El Monte ran over host Ganesha Friday night in a scrimmage. Booth scored four times, Cuevas 3 and Owsley twice as the Lions needed just 25 plays for the nine scores. Ganesha scored two touchdowns in 30 plays total. El Monte kicks off the regular season next Friday night at Baldwin Park. 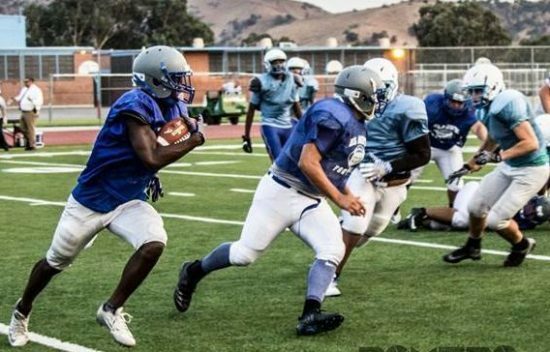 23 Comments to "El Monte Runs over Ganesha in Scrimmage"
To anonymous..you are correct. I don’t know if I can remember african american kids at el monte in 15 yrs of football. But hey, they are in the correct div to run that offense. Go get em EM. Didnt your Monrovia transfer just transfer out after a pair of good seasons. I guess he sees the ship sinking. I want you to look at the team and tell me who does and doesn’t live in the area you’ll be surprised. To Anonymous : You are absolutely correct El Monte is not Bishop Amant or Bosco Check out how many transfers they have .There are private schools in CIF that are actually getting up to 20 transfers this Year, and some schools even more . it’s hard enough for a public school to compete with the private and parochial schools in CIF . Much respect to to the principal at El Monte high school Mrs. Torres for the for the hiring coach Ceniceros If you like him or you don’t like him, he’s a proven winner. Two ex-players in the NFL and many others at the next level. Kudos to El Monte high school administration for the hiring of a coach of his caliber. The transfers to El Monte high school is a reflection of where this program is heading he is going to build a powerhouse there at El Monte . I will be traveling down the 605 to follow this program………..🏈 Seen him build a powerhouse in Norwalk . What do you mean by “those kids”? Get off your high horse, transfers are happening everywhere! You even have some of the Prep Sports writers joking on Twitter about 3 way trades between teams (most recently Mission Viejo, La Habra, and Mater Dei). It’s no secret, and CIF can’t (won’t) really do anything about it. Only time CIF-SS gets involved is when one of their playoff cash cows complains. Just enjoy the kids play the game! Hate to be that guy, but I also love being that guy, the transfers are intriguing. Say what you will but EM has some kids that are clearly not from the area. Let’s be real, those kids do not live in El Monte. Assistant coaches must be picking up the slack and bringing those kids to school. Good thing they’re not at Amat or Bosco, they’d have another thing coming. Last game of the year is the showdown you kitties have laid goose eggs the last two seasons. I see you you hit the waiver wire and signed outside help lol that’s ok you’ll need all the reinforcements you can sway to put on the uniform. I wonder if Davon will be able to play this coming week if CIF will clear him. Even though I seen arroyo this week and they don’t look like the arroyo of the last two years. You’re right a league title does go through arroyo, but not a CIF title which is bigger. Lions making a good run at both I think from what I’ve heard around the area. Got to play where you’re put and got to win there. What are they supposed to say “we’re in a crap league in the lowest division let’s go win 4 games”? CIF champs? bajajajajajajajajaja. I’m crying over here. Shyty league. Worst division . But ok. Let us see in 14 weeks. It’s more a post about the MVL. Like you said, EM doing big things so what else would be bigger than winning a league title? That’s why you play right? The league title goes through Arroyo SO since EM had a good scrimmage it begs the question, are they good enough to win league? Don’t be so sensitive, you’re from “MONTE.” Oh and I’m not an Arroyo fan. El Monte might have a legitamite shot, arroyo looked sorry on all 3 levels playing against ERHS last night. congrats to the lions…..for beating up on a team that is worse than them…all are excited now. why would that be news. Intriguing. The questions remains…do they have what it takes to run over Arroyo AND do they have the defense to stop Arroyo from scoring?? From T. Peterson: Got it. Thanks Davon.